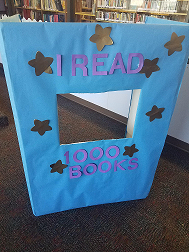 This weekend we held our very first 1000 Books before Kindergarten graduation! We had 10 graduates who reached this milestone. Some registered with our pilot program in October of 2016; others with our full rollout in January of this year. I am still flabbergasted at the amount of planning that went into the graduation. Try as we might, there were still last-minute details that threatened to derail us, such as a “broken” printer! Luckily, we pulled it together, thanks to my fabulous detail-oriented partner-in-crime Susan Flinspach, who has put in thousands of volunteer hours toward this program. I believe the parents, children, family members, volunteers and local officials that participated all had a great time. Here are some of the details: We decided that eight would be the magic number-meaning that if we had at least eight children that had read 1,000 books, then we could hold a graduation. Because children reach the goal at different times, we did not want to wait too long to hold the graduation, but also did not want to hold a graduation for too few children. Besides, some families might not have been able to attend anyway, despite careful planning. Next we sent an invitation letter to families in English and Spanish, along with an RSVP card. Can I just say that making the actual rsvp cards and deciding on the wording was a bit of a trial? We finally settled on two options for the card: Yes, we will attend, or No, we cannot attend. We originally wanted to give families the option of attending another graduation at another location or time, but decided that we would leave it to the families to reach out to us if they wanted another opportunity. The actual rsvp card was a pain because we did not want to send out an order to a print shop, so we had to make them postcard-size ourselves and then put them in the printer just so, and then flip them to the other side and insert the card stock the other way with the address, etc. And don’t forget postage! We didn’t want the lack of a stamp to slow down the process of getting responses, and of course we wanted a response by a certain date so we could(try to) plan. Out of the 10 invitations mailed, 7 rsvp’d yes by the deadline. We planned that we would be ready in case all 10 children and parents showed. Five children actually ended up coming. We of course gave all names to local officials that wanted to present certificates of recognition. Note: Double-check the spelling of names, especially if parents were the ones to fill out the original program registration form. We had one child whose middle name was incorrect through the entire program, and it only really came into play when we sent off names to local officials. We had a welcome table set up so that children, their parents, family members and guests could sign our guest book and sign a photo release. At this time, we handed parents an envelope with the kids’ reading logs. We held the program in our Little Theater, which doubles as our story time room. We set up a little chair alongside a larger chair so that each child could sit with one parent, and we put these in the front two rows, with the names of the children and parents so we could have them all together and close to the stage. I was the MC and introduced the officials and special guests. 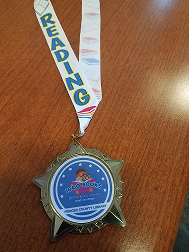 We had a poem read by our County Librarian, very brief remarks made by one of the Board of Supervisors(which we scripted, and which involved asking children about some of their favorite books). The same Supervisor read an oversized or big book, Splash by Flora McDonnell. For the procession of the graduates, we played Pomp and Circumstance which is in the public domain and which we had burned onto a CD-RW. Originally we thought we could just play it from one of our cell phones, but since this program is going to happen in other locations, we wanted it to be as simple as possible and we do not want to rely on the cell phones or technological abilities of staff at other locations. Children walked up the steps accompanied by a parent, to receive their medals, a giftwrapped book and several certificates. We had a volunteer photographer, and of course family members took photos on the spot. In addition, we set up a photo op out in the reception area additional photo opportunities. After final remarks and thank yous made by me, there was lots of applause and cheering, balloons were handed out, and we proceeded into the Children’s Room, which adjoins the Little Theater, for cookies, bottled water and more photos. I believe it all lasted about 45 minutes, tops. We purposely kept it short, since the average age of most of the children was 4 years old. Everyone had to take at least one photo in here, including me! I don’t think we could have done a better job. We wanted to children and parents to feel excited and proud, and I think we did just that. The only wistful thoughts that kind of nag at me, are these: I wonder if there was a way we could have had more of the graduates attend? Of course we had our regular stellar children who regularly attend our programs, but could we have made it easier for the others? Granted, it was our decision to hold the first graduation at our Main library, which is far for those at the outer edges of the county. Future programs will hopefully take place closer to where the children live. Also, how do we get beyond our regular customers? How do we break through barriers so that everyone feels welcome? Is it possible that parents did not bring their children because they were not sure if they need to dress a certain way, or because they did not have transportation? Maybe we could have explained in more detail exactly what would happen at the graduation? What if you yourself had never graduated, and did not know what to expect, so it was easier to just not show up? We were thrilled that one of our graduates who attended had heard about the program from his teacher. She walked the entire class every other week to the small storefront library near their school to turn in their reading logs. In fact, this little guy continues to visit the library with his mother and has read over 1,400 books! I am totally convinced that when a child has the support of his or her community, he has the opportunity to step outside of his normal environs. 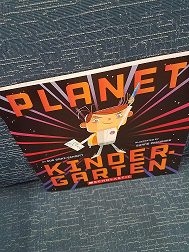 We know that the child who has been supported and read to from birth will most likely become a lifelong reader, but I am extremely interested in reaching those that for whatever reason, are not getting the message that reading boosts your opportunities and that libraries are for everyone! I love how you did all of this! I am hosting one in October and I have to say, I am a little nervous. Your party’s description is very helpful. I do love your achievement medals. May I ask where you found these?